Scotland’s seas are packed full of amazing life – the basking sharks that migrate to our west coast each summer are the world’s second largest fish, the Bass Rock is the world’s largest gannet colony and the cold water coral gardens on the Hebridean Slope hold some of the oldest living creatures on the planet. We’re particularly interested in these species and habitats because they form the backbone of the Scottish Government’s current approach to managing our seas. 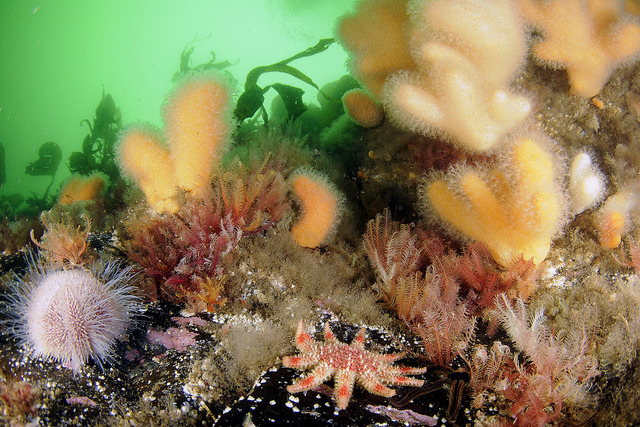 Along with another 70 odd species, they have been identified as “Priority Marine Features”, which, put simply, are some of the most important species and habitats in Scotland’s seas. Scotland has a National Marine Plan which was designed in 2015 and sets out the way we should make use of our seas. When it comes to protecting the environment, the Plan dictates that any use and development of the sea should not result in significant impacts on these priority features. General Policy 9 is a planning policy just like the important policies that guide sustainable development on land. In this series, we look at the role of each in underpinning the health of our sea, what has happened to them in the decades leading up to now and their current status, before considering what the future holds for such Scottish marine habitats and species as we hopefully move forward towards a more sustainable future.